After years of praying and planning and fund-raising and planning and praying and planning and praying and...the endeavor of moving the Central Texas Conference Service Center (CTCSC) into a new building on the campus of Texas Wesleyan University in Fort Worth took a huge step forward last Friday, Nov. 15 when ground was officially broken. Several key members of the New CTCSC task force joined Texas Wesleyan University President Fred Slabach during ceremonies held on the campus of Texas Wesleyan University to break ground on the greater Texas Wesleyan/ University Rosedale Renaissance Project. With a huge smile on their faces and a golden shovel in hand the group formally kicked off the next phase of the project that’s been in the works for the past few years. 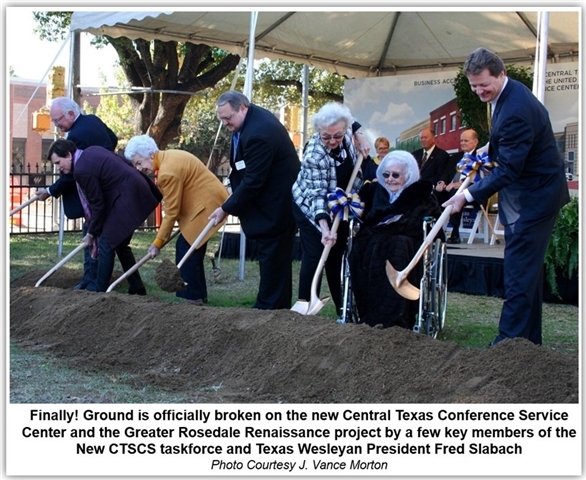 The new 15,000 square foot service center, which was officially approved during the 2012 Central Texas Annual Conference meeting, will be centered on East Rosedale Street, just across from the new clock tower and main entrance to the Texas Wesleyan campus. This is one of four components of the Rosedale Renaissance project, which also includes the clock tower and entrance, $32 million in street improvements and a Business incubator. Prior to “turning some dirt,” Dr. Wild pinch-hit for Bishop Lowry, who was engaged in the fall Council of Bishops meeting in North Carolina, and served as the conference’s representative at the podium. 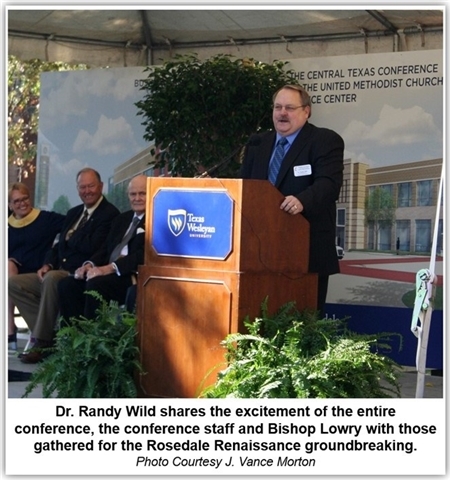 During his remarks, Dr. Wild highlighted one of the great hopes and joys of incorporating the new Service Center into the TWU Rosedale Renaissance Project - the opportunity to renew and expand on a long-standing and fruitful working partnership with Texas Wesleyan. Plans for the new service center are in the final design stages and construction is expected to begin early in 2014. No official timetable for completion of the building or when the staff would begin using the building as its base of operations has been announced, but it is hoped that the new home of the CTCSC will be open for business before we celebrate our sweet Lord’s birth in 2014. The below is video from Dr. Wild’s brief comments during the groundbreaking ceremonies as well as the ground breaking itself. Please pardon the windy audio quality and the (at times) shaky video. Visit txwes.edu for more on Friday’s groundbreaking event.